When the exposed face of a concrete slab is persistently damp, this could indicate you have Slab Edge Dampness. This can be due to a variety of factors including weather, poor construction or poor drainage systems. Slab Edge Dampness occurs when moisture is absorbed into concrete. This generally only affects the surface layer, however with prolonged and repeated exposure slab edge dampness begins to occur. This will happen much quicker if the concrete is also of a poor quality. Sometimes, you’ll see a build up of white powdery substance below the damp proof course (a layer of waterproof material designed to prevent rising damp). This substance is actually crystallised mineral salts, which are drawn from building materials or soils when the moisture comes out of the surface of the slab and evaporates. Why Is Slab Edge Dampness A Problem? Slab Edge Dampness can often go unnoticed for a long time. This means that it’s often only discovered once the condition of the slabs have deteriorated so much that they can not be saved. The danger with Slab Edge Dampness is that it can quickly affect its surrounding area and has been connected to deterioration of walls, soft furnishings and floors. 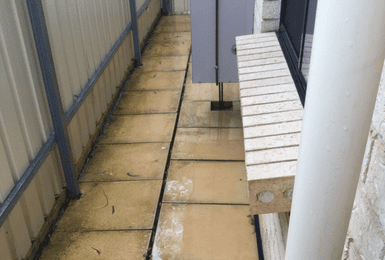 What Can You Do About Slab Edge Dampness? Tip: Ensure that all areas have adequate drainage. Poor drainage (pictured) can result in Slab Edge Dampness. Always ensure you have the appropriate drainage required to avoid overflow. This should be installed when you build your home. If you are buying a home, always ensure that you check the drainage system thoroughly or request that it is incorporated into your building inspection report. For outside paving, you may need to remove slabs that are closest to the wall in order to stop the spread of dampness. It is crucial to try and contain Slab Edge Dampness as quickly as possible in order to reduce the amount of damage it will cause. Forming channels for appropriate drainage will help to ensure that there is less build up of water. Not sure if you have a case of Slab Edge Dampness or Rising Dampness (Salt Damp)? Read our blog post on Rising Dampness or call Daniel on 0478 778 899 to discuss an inspection.